HISTORICAL records show that the Little Egret (Egretta garzetta) was once present and probably very common in Ireland and Britain. However, it became extinct in both islands through a combination of over hunting in late mediaeval times and climate change during a period of modest cooling in the Northern Hemisphere between the 16th and 19th centuries, sometimes referred to as the ‘Little Ice Age'. The inclusion of 1,000 egrets along with many other birds in a banquet to celebrate the enthronement of George Neville as Archbishop of York at Cawood Castle in 1465 indicates the presence of a sizeable population in northern England at the time. Further declines occurred throughout Europe as the plumes of the little egret and other egrets were in demand for decorating hats. This trend became especially popular in the late 1800s with statistics showing that in the first three months of 1885, 750,000 egret skins were sold in London alone. Another record from 1887 found in the 2005 edition of Birds Britannica shows that one London dealer sold two million egret skins. This over-hunting reduced the population of the species to dangerously low levels across Europe and was one of the main motivations used by a small group of women in Britain for establishing the Royal Society for the Protection of Birds (RSPB) in 1889, founded primarily to end the use of bird skins and feathers in the fashion industry. During a recent stay in Newcastle, Co Down, I had the pleasure of seeing three little egrets at the inlet of inner Dundrum bay, where the wide expanse of mudflat hosts a multitude of birds at low tide. 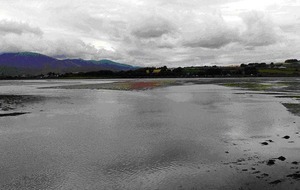 Their clean white plumage was, as American poet, Mary Oliver writes, like, 'a shower of white fire' against the dense, brooding background of the Mournes. She also talks of those 'bamboo legs from the thin and polished reeds', which are feared by 'the little green fish and spotted frogs'. Éigrit bheag in Irish, is a medium sized white heron, with long black legs, yellow feet, black bill and attractive plumes on its crest, back and chest. 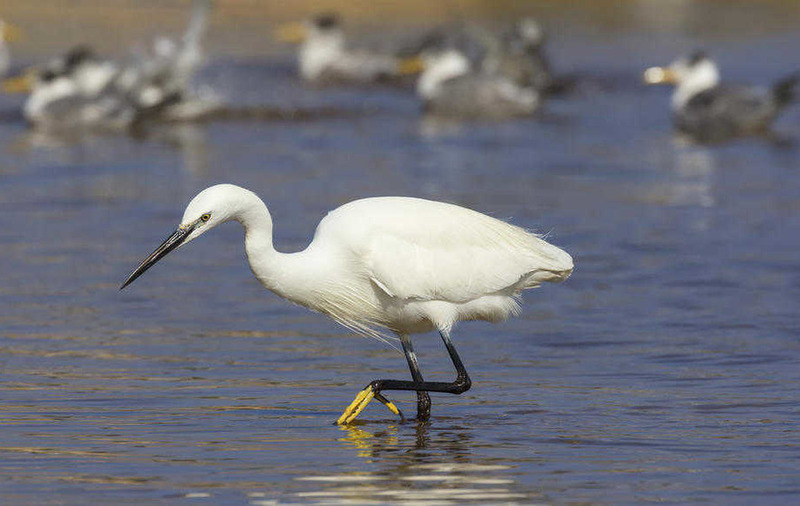 In the 1950s, the little egret had become restricted to southern Europe but the introduction of conservation laws helped the species recover strongly: in 1996, after a natural expansion of its range through western and northern France, the little egret bred in Dorset, England. A year later, the species bred for the first time in Ireland in Co Cork and now occurs as a breeding species in almost all Irish coastal counties as well as at some inland sites. Egrets, named after the French word aigrette meaning ‘little heron' or ‘plume', eat a wide variety of animals including small fish, frogs, snails and insects as they forage in wetland habitats from marshes to lakes, sites which they also use for breeding. In the Native American Cherokee tribe, the egret is highly revered, its feathers associated with peace and worn by diplomats when peace making. The indigenous Maori people of New Zealand also regard the related White egret ‘Kotuku' as something sacred and beautiful, a magical bird. The birds I watched were shuffling and jumping with raised wings through shallow water as they stalked their prey. With them, other waders, Godwits, Redshank, Lapwing and Curlew joined in the search for food before the incoming tidal waters began to swallow up the nutrient rich mudflats. As I retreated, I couldn't help but reflect contentedly on what a welcome addition these striking birds are to our avifauna.